One of the most amazing times I've ever had was at the PopKid/Waterslide show that happened while I was in Japan. I've written about it over the course of some of the reviews I've done since I've been back. This album is another direct result of that show. While there I was able to meet so many wonderful people who were in bands I already admired and some who were in bands I hadn't previously heard of. One of those bands I hadn't heard of before was Summerman. A very kind fellow was nice enough to give me a Summerman live cassette. While I haven't written about that yet, I will be in the future. 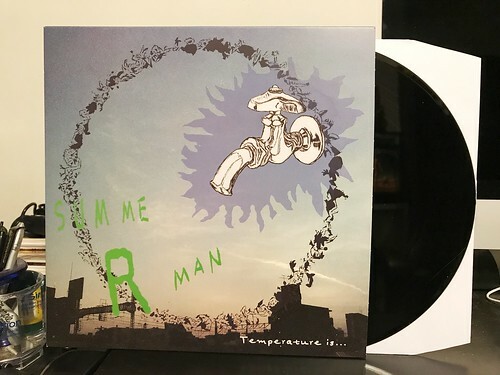 But that cassette inspired me to dig around for some more information about Summerman and I found out that not only had they released a full album, but it was actually on vinyl too. I picked up a copy right away. Temperature Is... quite simply is wonderful. I absolutely love this record. It's exactly the sort of thing I like to listen to. The bulk of the album is breezy guitar pop with jangly guitars and lots of harmonies in the choruses. There are parts of songs that remind me of the song structures of Beezewax but with a fuzzy dose of Superchunk tacked on for good measure. The entire album is fantastic, but the true peak is a song called "青春" (On the band's Bandcamp page it's called "Youth" and Google translate comes up with the same thing when I type in 青春). To put it plainly, this is one of the best songs I have heard in a long, long time. I can't think of many songs that I love as much as this one. From the way the guitars slowly build up at the beginning, to the main lead guitar riff blasting in, to the impassioned vocals that get even fuller and more dynamic as the song progresses, I love every single second. I don't say this often, but "青春" is an absolutely perfect song. Perfect. A friend in Japan said the band is working on some new songs and I couldn't be happier. I really want to hear as much as possible from Summerman, a great, great band. Seriously, go listen to "青春" right now.